Most experienced content marketers recognize that any goals that their content helps them achieve are likely the result of hard work and planning – much of which, ideally, gets done at the start. But that doesn’t mean even the most seasoned experts don’t have questions when it comes to how to set their team up for optimal success, or how to keep their content operations running smoothly. In my previous Book of Answers post, I addressed some of the most common questions the CMI team is asked when it comes to forming a content marketing strategy. But there’s still the matter of how to support that strategy with the right infrastructure. This time I’ve tracked down some answers on the essential skills, team resources, and operational processes you need to establish to enable your content engine to perform at its best for a long time. An efficient, effective, and well-organized team is your most important asset. Once you’ve put the right resources to work in the right places, you proceed with the confidence that many of the day-to-day content marketing tasks will be divided and conquered as skillfully as possible. How can businesses select and structure their content resources properly? Read on for insights on some of the most common team-related issues. Q: What roles do most content teams need? Content marketing varies based on an organization’s vision, mission, and industry. If you are focused on creating videos, you would need different roles than if your strategy revolves around a blog. Editor-in-chief (chief content officer) – This person leads the strategic direction, development, and management of the company’s content marketing program. The CCO’s primary responsibility is to determine how to approach content to achieve the company’s goals, though this person may play a high-level advisory role in making some of the tactical decisions involved. Managing editor – Whereas the CCO focuses on strategy, the managing editor leads its ongoing execution, including working with the creative team to manage the day-to-day workflow, and ensuring that content is delivered on schedule and in alignment with the editorial mission. Writers and editors – These creative-focused team members produce the content assets, routing them through the necessary review and approval processes, and making sure all quality, style, and strategy standards are met in preparation for final publication. Designers – Also part of the creative team, designers typically own the way content efforts will look, feel, and function in their final published form. Their responsibilities can include other visual considerations, like logos and branding. Producers/webmasters – These team members are in charge of the technical details of the publishing process — from working with the content management system to set up templates and build content pages, to managing the final scheduling and publishing process, to ensuring that all site content is functioning properly, both behind the scenes and from the perspective of the audience. Find more answers: Of course, the content marketing process doesn’t end when the story gets published — plenty of other tasks are involved in ensuring that your content reaches the right people and drives the intended actions, including SEO optimization, community and influencer management, audience development, and more. Check out this post on the 10 Most Critical Content Marketing Roles to see what other capabilities you’ll need to account for. Q: What skills should we require of potential content team members? Promotional expertise – Awareness of best practices for publishing content on all the appropriate channels and platforms, and knowledge of the key promotional techniques for maximizing its reach and impact. Social media management capabilities – Understanding of the social landscape, and the ability to monitor and participate in relevant conversations within your social communities and among other key influencers. Audience development experience – Proven expertise at what it takes to build and grow an audience, including lead generation, lead nurturing, and customer relationship management. Experience with key analytics, tracking, and measurement techniques – An understanding of what to measure, how to measure it, and how to make that data actionable is critical to maintaining a high-performing content program. Data analysis – Knowledge of how to separate the signal from the noise, understanding of what the performance data is saying, and ability to translate it into sound decision-making. Intellectual curiosity – Content marketing is a dynamic and ever-evolving field. For your content efforts to stay in step with important industry and audience trends, it’s helpful to have someone on your team who loves to read, learn, and apply new skills and techniques to the work they do. Listening skills – To perform at its best, content marketing needs to be a two-way conversation that puts your audience’s needs ahead of your own. This isn’t possible if you aren’t willing to hear what they have to say. Willingness to break new ground – To be truly creative means being open to experimentation — and accepting that you might not always succeed at your new endeavors. Look for someone who is willing to try new things and is able to learn from their inevitable missteps. Comfort with emerging technology – Digital tools and systems evolve. It’s helpful to have someone on your team who is comfortable with being on the cutting edge and helping other team members get up to speed. Ability to communicate well with others – Content marketing is a team sport. It helps to have good negotiating and people skills in your corner when the need arises to resolve team conflicts, or to communicate and justify programs to upper management. Q: Is it better to work with in-house teams or outsourced talent? When it comes to content marketing, there’s no definitively right way to build a competent team — it all comes down to what goals you are trying to achieve and what your plans are for reaching those goals. Fortunately, with a well-thought-out strategy, even a team of one can achieve considerable success. Still, even the most effective content marketers are likely to feel some pressure to keep up with the growing demand for valuable content, which can result in the desire to add more resources to their arsenal. How much control do we need to maintain over our messaging? For example, if your content could involve trade secrets, proprietary information, or other confidential (or controversial) ideas, it may be better to keep your efforts in the family. Will our organization’s time be better spent on hands-on creation or delegation? Remember: Outsourcing doesn’t necessarily mean handing over the keys to your content empire and walking away — you still need to manage that relationship. What level of industry expertise will our content require? An in-house team member will be deeply immersed in all the details of your brand and its audience on a daily basis, and will likely have ready access to subject matter experts. But it might take an agency or freelancer some time to develop a comparable level of industry experience, topical expertise, or network of reliable influencers. How quickly do we need our program to start producing results? Naturally, no one wants to sacrifice speed for effectiveness. But if you have a particular need to hit the ground running, it may be more efficient to onboard a fully functioning content engine, rather than building your internal capabilities from the ground up. Find more answers: Need a little more guidance on whether or not to hire a content marketing agency? Kathryn Hawkins outlines some additional situations where leveraging an agency’s content expertise might come in particularly handy. Q: How do we find the best content creator(s) to work with? Regardless of whether you decide to hire in-house or rely on freelance writers, you still need to carefully vet your candidates. Good content creators can come from many backgrounds and fields of experience. Rather than looking for someone who has held a certain job title or has followed a particular career path, look for signs that the candidate is capable of balancing creativity with strategic thinking, and can bring a sense of personal passion and drive to every initiative they touch. Portfolio – The quality of work is more important than what company or what industry they produced it for. Working style – Content creators need to comfortably interact with various personalities and work well with content team members, as well as colleagues who operate in other functional areas. How well they might fit in with your company’s culture is a surprisingly important consideration. Adaptability – The best content marketers are often those who can demonstrate that they are strong “mental athletes” — professionals who are capable of learning new skills quickly, are open to experimenting with new tools and techniques, and are comfortable changing direction on a dime in response to an emerging opportunity or a shift in trends. Attention to detail – Though hard to test for, this skill is particularly useful. Beyond its value when it comes to maintaining high quality standards, it can enable your content creators to uncover and explore untapped opportunities for your business to gain a competitive advantage. Find more answers: Vetting and on-boarding freelancers comes with its own unique set of considerations. Check out this guide from Barry Feldman for tips and advice on sourcing, selecting, and managing your freelance content creators. Q: Where should our content team fit within our organization? As the name implies, content marketing typically sits in the marketing department. However, content marketing frequently affects and involves many disciplines within the organization — including sales, public relations, product management, customer service, and even human resources. Since every company will have its own unique collaboration processes, reporting hierarchy, culture, and communication style, you are unlikely to find a single right way to structure your content team for optimal success within the organization. All-in, ad hoc models work well within organizations that are “beginning the shift.” But once your content marketing department is more established, you may want to dismantle this silo for better integration with other content creators across your organization. Engaging external content marketing agencies and in-house “agency-like” teams seems to work best with large companies trying to mature and/or experimenting with different models. Assignment of channel managers works best when there is a primary-owned media platform (e.g., a blog). A central strategist model seems to work effectively when the business already has executive buy-in and the effort is to fundamentally transform the team. Find more answers: If you are concerned that siloed content creation models might hinder cross-functional synergy and efficiency in your organization, try this common denominator approach, which can help you tackle departmental tunnel vision. Think of the management practices you adopt as the key to keeping all the moving parts of a content engine humming along harmoniously. Remember: Your team members can’t achieve their content goals if they don’t have the right systems in place to stay focused on their responsibilities, or a clear understanding of how the role they play fits into the “big picture.” In turn, your business can’t expect to realize its big-picture goals if there’s a breakdown anywhere along the chain of command, or if the content engineers haven’t been given the right blueprints for construction and maintenance. Q: What can we do to enable our team members to work well together, and ensure that their efforts will be as efficient and productive as possible? Typically, these tasks can be tied together into an editorial workflow — an overview of all the steps involved in all content marketing projects. Not only does a workflow give your team clarity on who’s involved in content marketing, what specific tasks need to be completed, and in what order they should ideally be tackled, this structure can help identify opportunities to streamline your process or to make temporary adjustments in response to an unexpected delay or rush request. Once you have an outline of your basic workflow, it can serve as a template that you can modify for other types of content you create. You can also integrate it with certain content management systems, which can enable your team to automate the routing process and make sure each content piece goes through the editorial process. 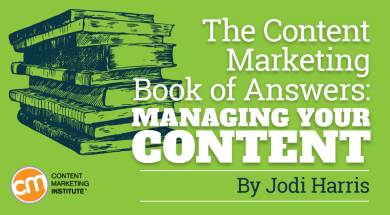 Find more answers: Want more details on how to create and manage your content workflow? Read Raechel Duplain’s deep-dive post on the full workflow development and documentation process she uses. Q: What additional tools might help make our content marketing operations run more smoothly? Strategic and workflow decisions aside, content marketing success often boils down to the small details that make your content efforts distinct, relatable, and relevant — in other words, the unique way your business will craft its content to build awareness, engagement, and loyalty within your audience. Editorial style guide: This document outlines all the editorial criteria that make your content distinguishable as uniquely yours. It is a particularly useful resource to share with content creators who function outside of your core team, as it can help them understand the tone, voice, and grammar standards they will be expected to uphold in order to maintain a consistent level of quality across all your business’ content pieces. Editorial calendar: This document can be as simple as a spreadsheet of the topics you plan to cover (and when) and on which channels over a given period, or as sophisticated as a comprehensive, real-time solution for managing all your editorial assets as they are routed through your workflow — or it can lie somewhere in between. 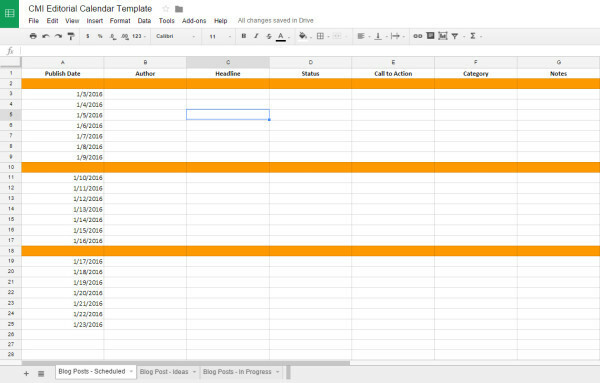 For example, the CMI team uses a multi-tabbed spreadsheet that’s based on the editorial calendar template below to track and manage our blog post assets from conception to completion. Click the image below to download your own copy, which you can customize to your team’s specific content needs (go to “File > Download As >” and select the format you would like). Contributor guidelines: If you plan to work with multiple content creators, you should outline your criteria for accepting submissions, including the stylistic, technical, and topical requirements for your content program. This document can also be used by your company’s content creators (both those within and outside the marketing team) to make sure everyone is on the same page when it comes to acceptable ideas and approaches and those that might fall outside your content niche. For example, take a look at CMI’s contributor guidelines, which can serve as a model for setting your own contributor criteria. 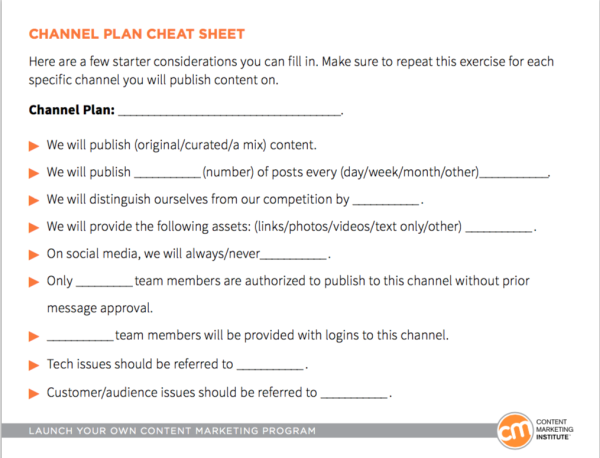 Channel plan: This governs how, when, and on what specific platforms you will publish content, as well as any rules of engagement that your organization has outlined for interacting on those channels. What other questions are still on your mind? How to build your team and provide its members with the infrastructure and support they need are among the most important content marketing considerations any organization can face. But all the planning and prep work in the world won’t bring success if you don’t have the right content to feed into your engine once it’s built. Look for a future Book of Answers post to address some top questions about content creation. But in the meantime, if you need more information about teams and operations, please share your questions in the comments. A sound editorial process is one of the five core elements for running successful, scalable content marketing operations. Read our 2016 Content Marketing Framework: 5 Building Blocks for Profitable, Scalable Operations for an overview of the full strategic blueprint.